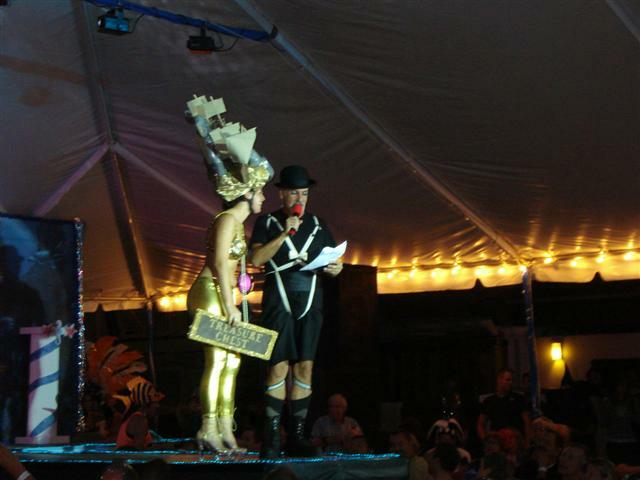 I worked the front desk at the Headdress Ball a couple of weeks ago, part of the annual 10-day Fantasy Fest here in Key West. My pictures aren’t the greatest, but I wanted to share because some of the headdresses were so amazing! 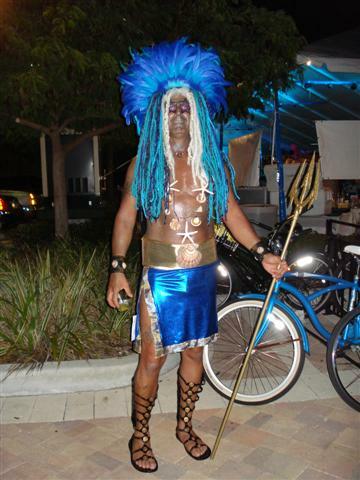 The theme of this year’s Fantasy Fest was Aquatic Afrolic. 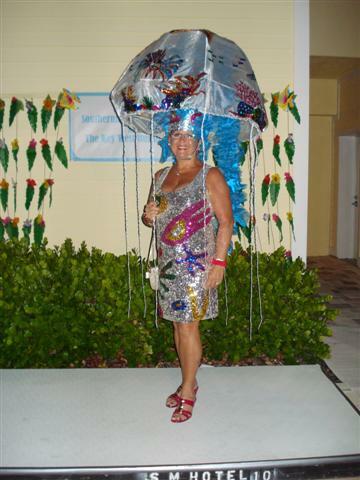 She’s part of a very sparkly dyad of jellyfish! This couple was staying in the hotel where the Headdress Ball was taking place, they only entered the contest because we thought they were so fun. I loved this mermaid’s body paint. 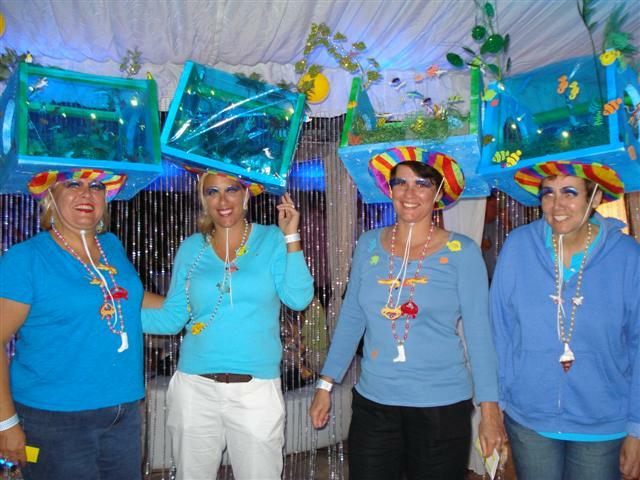 This group wasn’t even competing, they came dressed up to watch. Same with these guys, only there were, like, TEN of them!! 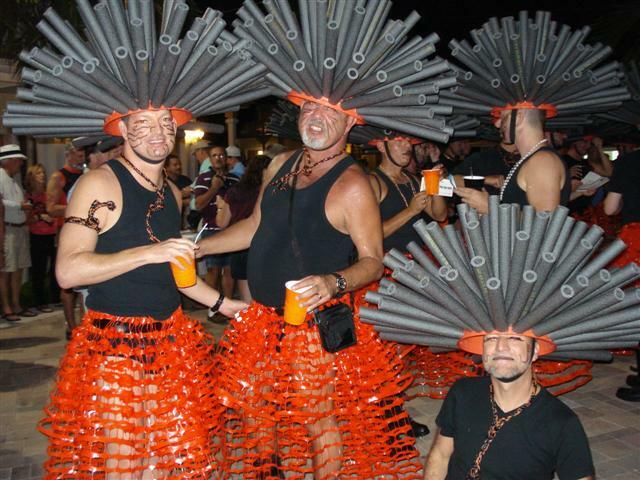 Can you tell that their skirts are made of construction fencing? One guy had fashioned his into a bustle instead of a skirt. I had a backstage pass so I caught up with these ladies after they hit the runway. This is Inga, a local celebrity, leading the audience in the Chicken Dance and a naughty number. This ensemble wore my favorite costumes, 18th century-ish. The queen wore pink frilly pumps, which I coveted, and satin bloomers. The boys are wearing crushed velvet hot pants. Ooh la la. 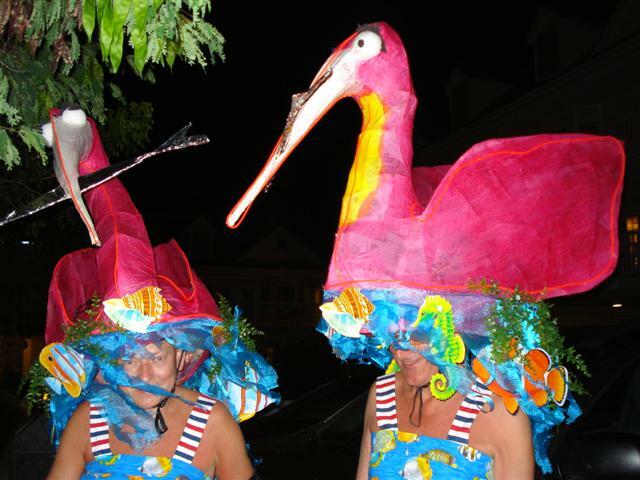 These gents come from across the pond every year for Fantasy Fest, and I adored their light-up flamingos. This girl’s headdress is a ship being attacked by a kraken. The ship had an on-board cannon that shot confetti cannonballs. I dig this scaly costume made from paint samples. I couldn’t get a good shot of these snooty girls from NY. 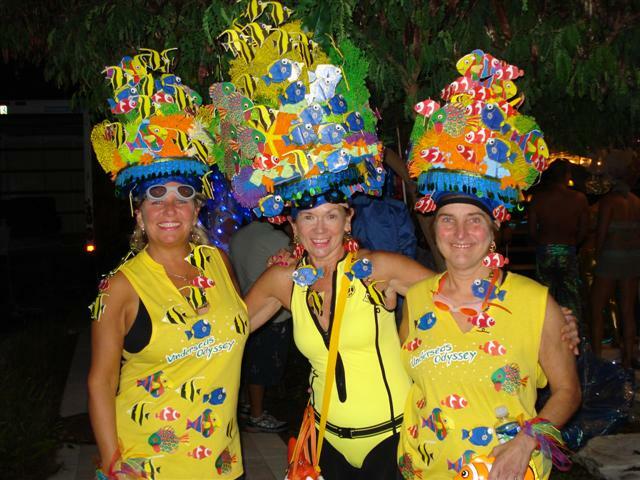 But they had the most amazing headdresses made from real sea sponges and coral fans. They were wrapped in olive green and tan fish nets. 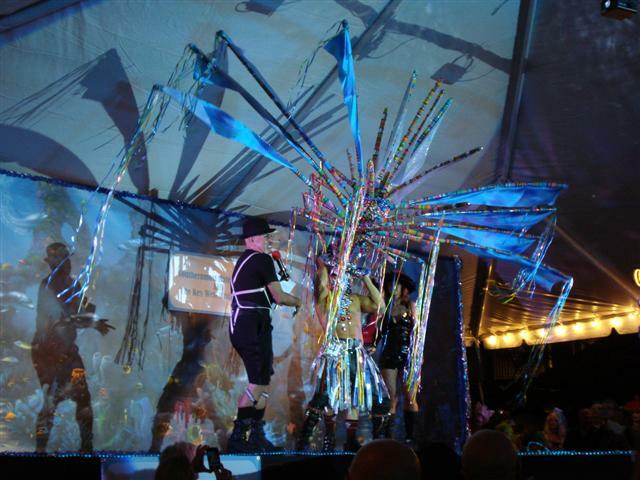 This headdress features a functional water fountain up top. This guy was sporting a HUGELY heavy headdress and he fell off the stage… onto my husband, who saved him from breaking his neck. Zach’s knee is still hurt from the strain of catching this guy and his getup. Christopher Peterson sang a number and sounded great. This fellow had something of a flamingo theme going on. 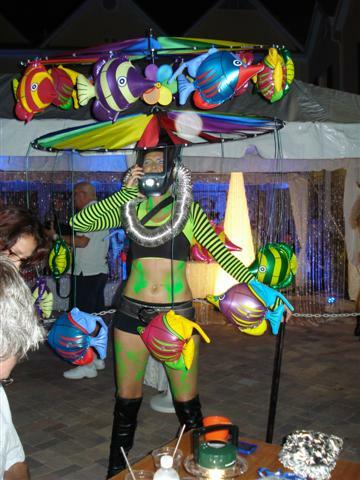 I absolutely loved this Las Vegas style clownfish costume. 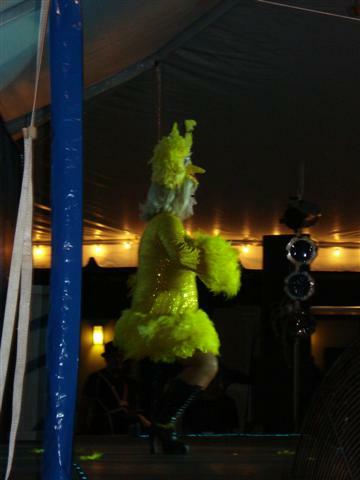 She had tailfeathers to match! This was the coolest Fantasy Fest event I’ve been to so far!